Tonight, I tended bar at a museum function. And by "tended bar," I mean that I poured white wine, made change in pounds, relieved museum-goers of their empties, and washed some dishes. On my way home, I passed Goth girls in scads, and then I passed a whole Goth hen party. And by "hen party," I mean girls having a bachelorette do for someone about to get married--and doing it in matching black t-shirts and matching pink facemasks. On Monday, my Canadian friend's laptop melted down about two hours before she was due to give a presentation. 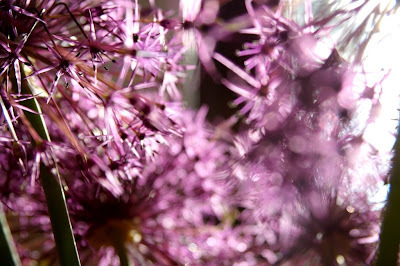 Because I gave her some last-minute help, she bought me six stems of allium, and five days later, they're still going strong. (Which is good, because Marks and Spencer guaranteed them for at least seven.) They might be the most fascinating flowers I've ever had in my presence. And the fun I had photographing them with my auto-focus shut off makes me wonder what else I should take out of focus for awhile.